The Dream Eze AIO is one of the easiest to use, nothing extra to buy, nothing extra to do, daddy friendly diaper there is. With that said my first look at the Dream Eze AIO left me wondering what on earth was going on? Its one of the only side snapping diapers we have to review which at first I felt was a bit odd after using all these front snapping diapers, but I quickly learned exactly why side snaps are nice. 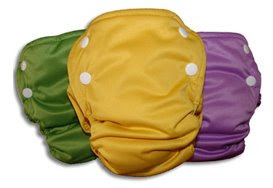 Cloth diapers are notoriously poofy which leaves pants sometimes fitting a little odd, with a side snapping diaper the bulk is taken away from the front of the diaper which leaves a nice flat front for pants. 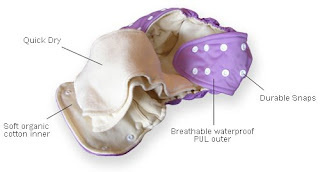 The other thing that threw me off a bit was the diaper liner and soaker is sewn as two floating panels inside the diaper so there is nothing to stuff and you can fold the inside liners however you want. The advantage to this is that when it comes time to wash the diapers there is nothing to unstuff when it comes time to wash them and nothing to stuff when it comes to putting them away. The Dream Eze AIO liner is also made of 100% organic cotton. So easy that even your daycare will agree to do it. Very low profile, trim diaper. No need to buy an extra liner for overnight use. If your used to using pocket diapers you may find the sewn in liners frustrating as you can't change them out to suit your needs. Diaper seems to run a bit small so pay attention to the size measurements. Limited color options available thus far. The Dream Eze AIO is made by Natural Baby Company you can use their retailer search to find a store that sells them. So does the AIO dry faster than others since the soaker and the liner pads are only sewn in at one area? It certainly would dry faster than all in one.. but I did not see that it dryed noticeably faster than a pocket diaper as a pocket the liner and diaper are separate items.